Inhibits the activity of gualuronidase, the enzyme that damages blood vessels. Atherosclerosis. Taking “Laviocard+” together with course of medical treatment the concentration of cholesterol and its atherogenic fractions is reduced as well as the coefficient of atherogeneity of blood plasma, the level of triglyceride goes lower in blood, that favours the reduction of atherosclerosis development. Ischemic heart disease, impaired cardial function, rhythm heart disturbance. “Laviocard+” promotes improvement rheological blood properties as well as the condition of erythrocytes, improves its deformability and hemodynamic characteristics. Arterial hypertension I, II types. “Laviocard+” helps to normalize the blood pressure, decrease it daily fluctuation range, improves vessels tone and cerebral blood flow. As a prophylaxis and in the period of rehabilitation after having an infarction and stroke. The complex “Laviocard+” restores the microcirculation, favours the improvement of venous drainage, decreases the hypoxemia, has an influence on metabolism in cells. Varicose diseases, phlebothrombosis, postthrombophlebitic syndrome. For venous walls strengthening, venous blood flow improvement, prevention of thrombosis formation and edema reduction. The course of medical treatment by the complex “Laviocard+” could help to decrease the intensity of “varicose veins”. Complications of pancreatic diabetes. Is used for microcirculation improvement, strengthening of capillary channel, decreasing of insulin resistance. The quality of life is improved. Worsening and complication of inflammation. Improves the resistibility, decreases the evidence of inflammation, prevents the exacerbation and chronic inflammatory diseases. Dysbacteriosis: improves nutrition and growth of bifidobacteria and lactobacilli, promotes better disintegration, nutritive absorption and digestion in the gastrointestinal tract. Gastric and duodenal ulcer: taking VitaLAG together with course of traditional medical treatment contributes to a more rapid and effective reduction of pain syndrome, dyspeptic disorders (sickness, vomiting, heartburn, appetite disturbance, meteorism). VitaLAG has a protective effect on the mucous membrane, promoting healing of gastric and duodenal ulcers. Gastritis: VitaLAG improves regeneration of the gastric mucosa, reduces the intensity of inflammatory processes. Immune system disorders: VitaLAG is recommended as the fortifying agent for improving the protective potency of the organism, resistance to infectious diseases and harmful environmental effects. 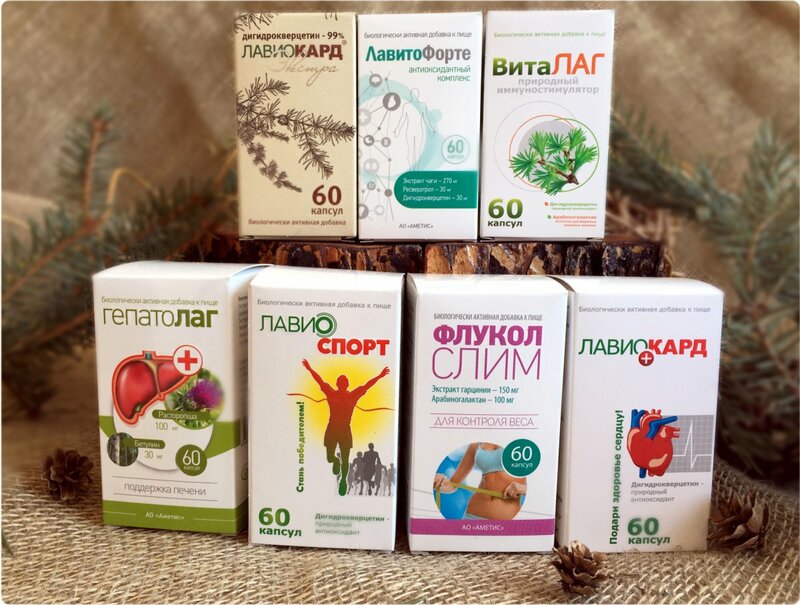 Cardiovascular diseases: VitaLAG helps normalize blood pressure, improves blood microcirculation and cerebral circulation, reduces the effects of hypoxia and ischemia. A unique combination of Vitamin C with Dihydroquercetin has a powerful synergistic effect that promotes the comprehensive protection of the cardiovascular system. Laviocard Extra is recommended as a source of Dihydroquercetin and an additional source of Vitamin C.
Laviocard Extra was developed as a means to improve the functional status of the cardiovascular system, and as a complex therapy of hypertension. Arterial hypertension I, II types. Helps to normalize the blood pressure, decrease the appearance of headaches and giddiness. As a prophylaxis and in the period of rehabilitation after having an infarction and stroke. Improves cerebral circulation and coronary vessels.